As summer wanes and the crisp fall air makes room for more snuggle time we’re preparing for another awesome Saturday at the market. Since it’s launch we’ve had a mix of returning and new vendors and it’s been amazing to sample and take home sweet and spicy caramel, baba ghanouj, coffee and some amazing scallion pancakes.Â This week we’ve got folks providing soup, caramel, pickles, jam, empanadas, spreads and baked goods and more all ready to consume and take home, so make sure to come by and sample some delicious treats! We’d also like to make a humble request, only to ask you to continue spreading the good word about Greenpoint Food Market within your community. We depend on word of mouth and a curious and hungry belly andÂ appreciate your support thus far. I have a confession to make: this is something I have long planned to check out but have simply never gotten around to. Methinks this weekend I will have to do something about this. 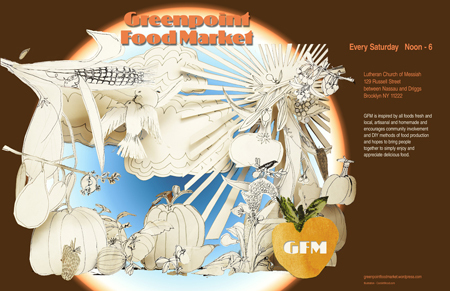 You can learn more about the Greenpoint Food Market by checking out their web site. CAVEAT: do not click the previous link if you are hungry! Every Saturday, Noon until 5:00 p.m.